Wikimedia CEE Meeting is a meeting of the Wikimedians of Central and Eastern Europe. The idea was conceived at an informal meetup that took place on 6 August 2011 at Wikimania 2011 in Haifa. Most of the attendees from the countries of the region were present, and shared their experience in the efforts to establish a more global community. Many countries of Central and Eastern Europe are not only related with their geographical proximity, but also share some traditional and historical issues. The region covers an area that has previously used to be a part of a wide cooperation among the peoples living there. Wikimedia CEE Meeting 2012 was held in Belgrade with around 45 participants. <Wikimedia CEE Meeting 2013 was held in Moldova with around 35 participants. Wikimedia CEE Meeting 2014 (#WMCEE) is the third annual meeting of Wikimedians from Central and Eastern Europe. It is took place in Kyiv, Ukraine on 19—21 December 2014 and it was co-organized by Wikimedia Ukraine. could be used to combine national narratives into NPOV on various historical and political topics. WikiAcademy Albania and Open Labs were for the first time part of Wikimedia CEE Meeting held this year in Kyiv, Ukraine. WikiAcademy was part of two different sections, in the education program and the gender gap section. WikiAkademia is an education program which is been active for more than a year with workshops and presentations in different albanian schools and universities. The first day of the conference started of with presentations from all the participating countries and the results of projects related to Wikis in each one of them. Getting to know every country’s work made this section very challenging and inspiring. Even though WikiAcademy is considered a story of success, witnessing the other projects from other countries helps get more inspired with lots of new ideas on how to implement these instances in our country. Wikiexpedition was one of the most interesting sections, which is going to be part of our next events in Albania. This is the first international Wikipedia meeting that WikiAcademy is attending and we are so proud and excited that we had the possibility to share our experience with others and in the meantime get the best scenarios from them. Apart from the social part where you get to know awesome people who share the same ideas and visions as you, attending this conference meant learning a lot from each one of the participants and helped with the motivation to keep going on with our mission. On day zero occurred socialization – the guests met in the dining room, where they discussed the details of the upcoming conference. On the first day of WCEEM 2014 was held the opening ceremony, during which the Ukrainians – the hosts of the conference, were welcomed by the audience. Participants continued acquaintance during the session State of the Movement, where representatives of the departments of the Wikimedia Foundation spoke about the status of their organizations and supported projects. Informed the audience about successful projects and needs. Moderated by Andriy Makukha(Board memeber of Wikimedia Ukraine). 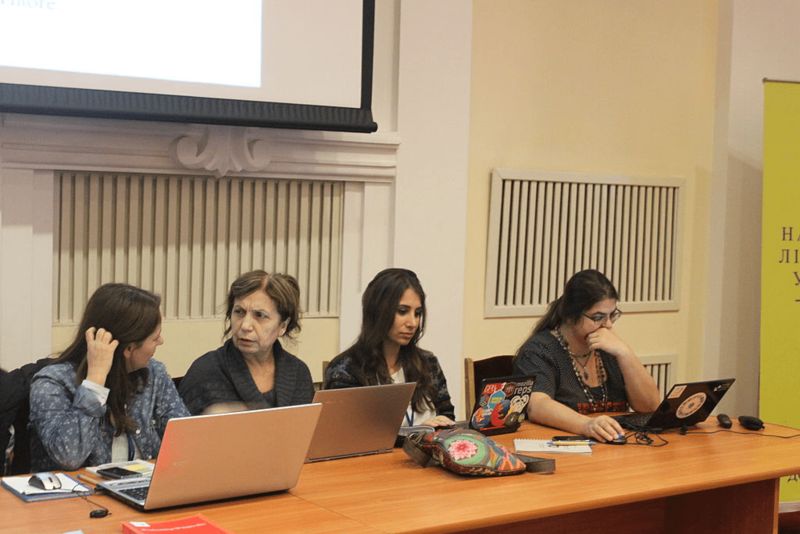 During the second session, devoted to “Freedom of panorama”, Wikimedia Armenia shared her experience of its legalization in the country through direct lobbying. “Wikimedia Ru” also spoke about their experience of making appropriate amendments to the Civil Code of the Russian Federation. It was noted that many countries of Central and Eastern Europe do not have the freedom of panorama, and project participants from these countries are not able to upload media architecture. Moderated by Susanna Mkrtchyan, speakers – Andriy Makukha and Vladimir Medeyko. In a parallel session discussed the draft Wikiexpeditions. The participants noted that this project is very important for the generation of content about specific cities, villages and regions. Moderator – seventh registered in the English Wikipedia Polimerek, speakers – Jan Groh, Nickispeaki, Visem, Kaiyr, Polimerek. After that, the participants gathered for a group photo. The second day began with a presentation of the project of Education program, during which was discussed how to attract students to participate in improving Wikipedia. There are a lot of successful models from different countries, which can be used to create or shape the educational programs in different regions. Moderator – Anna Koval, speakers – Ata, Jan Groh, Vassia Atanassova, Greta Doçi, Filip Maljković, Kaarel Vaidla. At the same time the session about Common legal threats + AWB was taking place, during which they discussed the problem domain registration, control of the state, and so on. D. Moderator – Levon Azizian, speakers – Polimerek, SpeedyGonsales, Magioladitis. During the second session, “How to organize a seminar / training” (Eng. How to organise a workshop / training) details on the organization of seminars and training courses were discussed. Moderator – Mickey Mystique, speakers – Susanna Mkrtchyan, Sviatlana Yermakovich, Hannabaradzina, Tomasz Bladyniec. During the third session of the Article contests & thematic weeks, the group discussed the successful theme weeks and competitions in various communities. Moderator – Polimerek, speakers – KuboF, Andriy Makukha. In the same time was held the session on Microgrants / scholarships + Local fundraising, where they discussed various options for grants and how to successfully use them. Moderator – Masti, speakers – KuboF, Asaf Bartov. During the second session, How to organise a workshop / training were discussed details on how to organize seminars and training courses. Moderator – Mickey Mystique, speakers – Susanna Mkrtchyan, Sviatlana Yermakovich, Hannabaradzina, Tomasz Bladyniec. Parallel to this, was held a session of GLAM, where speakers told about successful projects with galleries, libraries, archives and museums. Moderator – Vassia Atanassova, speakers – Kaarel Vaidla, Zana Strkovska, Julia Maria Koszewska, Ivana Madžarević, Mickey Mystique. At the end of the day students were taken to the Christmas Fair, after the tour of the Evening Kiev when we were amazed with the beauty around the city. Members of the Wikimedia Ukraine at that time held a reporting back meeting where they also elected new board members. The third day began with a session devoted to the international competition “Wiki Loves Monuments” and “Wiki Loves Earth”, where the organizers exchanged experiences and strategies for their implementation stories, as well as summarized key outcomes photo contests in the region. Moderator – Illia Korniiko, speakers – Zana Strkovska, Nikola Cibrev, Polimerek. At the same time was being held a session on Gender gap, where we discussed the issue of gender bias in Wikipedia isledovanija on this topic, the views of editors and readers. Raised questions concerning the interaction of participants and views on the policies and guidelines of projects, dispute resolution and the election of the administrative staff, the approach to the creation and deletion of articles. Moderator – Anna Koval, speakers – Greta Doçi, Kaarel Vaidla, Julia Maria Koszewska, Susanna Mkrtchyan. The next session was called “Making small Wikipedias grow”, during which we developed a strategy that can help Wikipedia grow bigger and faster. Moderator – Eva Lepik, speakers – Gheorghe Iordachi. One of the sessions was about recruiting volunteers, where they discussed strategies to attract people to the movement of the Wikimedia Foundation. Moderator – Asaf Bartov. Then the closing ceremony, where we summed up the meeting and discussed plans for the future. The meeting was so useful, when everyone had the opportunity to learn a lot and to socialize with all Wikipedian participating. The participants were very satisfied and everyone think these kind of events should be more frequently. Noted the high level of organization and friendly working atmosphere. Among the shortcomings of the students noted video broadcast, which is not allowed to follow the work online.